Global governance is facing new challenges amidst a growing backlash against economic globalization and the resurgence of unilateralism and protectionism. "We are just at the beginning of globalization 4.0, and are significantly underprepared for the magnitude of change we are facing," warned Klaus Schwab, founder and executive chairman of the World Economic Forum last November. Speakers at the 5th China & Globalization Forum held in Beijing on Sunday shared their views on the changes taking place in today's world and the action needed to meet the challenges in the era of globalization 4.0. Former Chinese Commerce Minister Chen Deming said that setbacks are normal along the path to globalization, which is an inevitable trend in human development. He said that the most urgent challenge facing globalization now is to improve multilateral rules, and the decisive factor for the improvement is a new type of relations between major countries. "Updating the rules are impossible if major countries always run in opposite directions." "When participating in global governance, we need to uphold multilateralism and bear in mind that our country still and will long remain in the primary stage of socialism," Chen added. Gao Anming, vice president of China International Publishing Group (CIPG), also emphasized the importance of multilateralism, saying that all participants need to break the hold of egocentric mindsets and jointly establish a feasible and sustainable global governance system. He said that in the era of globalization, different countries and organizations are increasingly interdependent. And with their participation in global governance becoming more interactive, he added that they need to take concerted action to address issues concerning the common development of mankind. Nicholas Rosellini, the United Nations (U.N.) resident coordinator in China, said that globalization 4.0 undoubtedly brings opportunities, but also brings with it risks, which, if not properly managed, will widen inequality and leave a lot of people behind. He said that the unprecedented pace of technology in the Fourth Industrial Revolution is fundamentally transforming the means and systems of education, health, production, etc., thereby presenting opportunities but also risks of growing inequality. "The response to the challenges is not nationalism or protectionism. Globalization 4.0 is an unstoppable force. Global challenges require global solutions and business as usual is not enough," Rosellini said. He said that managing the risks of globalization 4.0 requires a complete overhaul of the approach to economics, rethinking education, health and production systems to ensure no one is left behind. "Changes must take place at the national and international levels." Rosellini said that the U.N., which has been a cornerstone of multilateral governance, now finds itself unable to meet the challenges of globalization 4.0. He added that Secretary-General António Guterres has therefore introduced the most ambitious reform of its organizational systems to elevate the voices of the underrepresented, better realize the 2030 Agenda for Sustainable Development and respond to the challenges of globalization 4.0. Rosellini made reference to another positive development - that China has emerged as a strong proponent of multilateralism and international cooperation. He said the Belt and Road Initiative, which is committed to connecting countries and peoples, enhancing infrastructure connectivity, and promoting trade and investment, is a new platform for globalization with potential to accelerate the benefits of globalization 4.0 and contribute positively to the 2030 Agenda for Sustainable Development. Chen Jian, former Chinese vice minister of commerce, said that it is necessary to reform the rules-based multilateral trading system, which is not inclusive, equitable or reasonable enough to meet the challenges facing globalization. But he noted that the reform should be a process rather than a rapid correction. "The best choice is to constantly improve global governance while safeguarding the existing rules. We must not resort to destruction without construction." 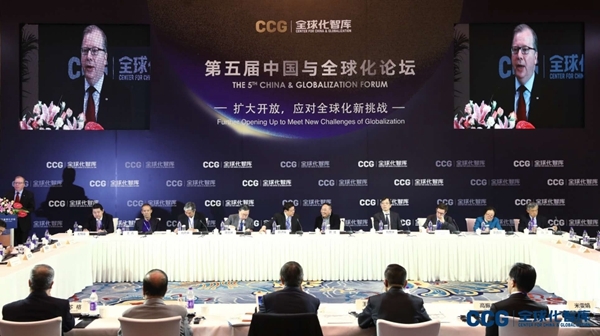 The forum was jointly organized by the Center for China and Globalization, the China Association for International Economic Cooperation, U.N. China, in partnership with the Academy of Contemporary China and World Studies at CIPG.